As important as it is to know where food comes from physically, it has been equally fascinating to investigate the origins of food historically. As a recipe disseminates into its various forms, a common denominator still stands. Indeed food is what we all have in common, and it plays an integral part of our lives and culture since time began. It has been gratifying to explore the ingredients we use today in relation to how they were used in the deep past, and thereby feel a connection and kinship with our ancestors. So we have covered the history, the additions, and my personal experiences with cornbread. 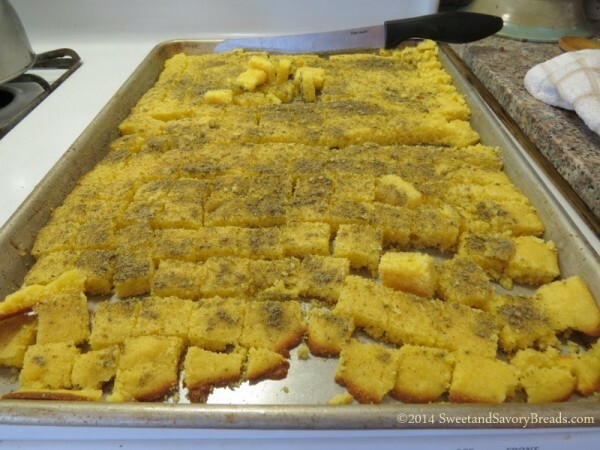 Today it is time to wrap up the series with a recipe that uses cornbread as an ingredient. 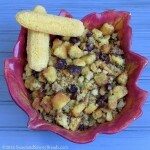 This cornbread dressing recipe utilizes the sweetness of dried cranberries and is offset by the saltiness of sausage. The cornbread acts as a vessel for the all important sage, and it buoys the onion and celery into a casserole fitting any Thanksgiving table. HAPPY THANKSGIVING FROM SWEET AND SAVORY BREADS! 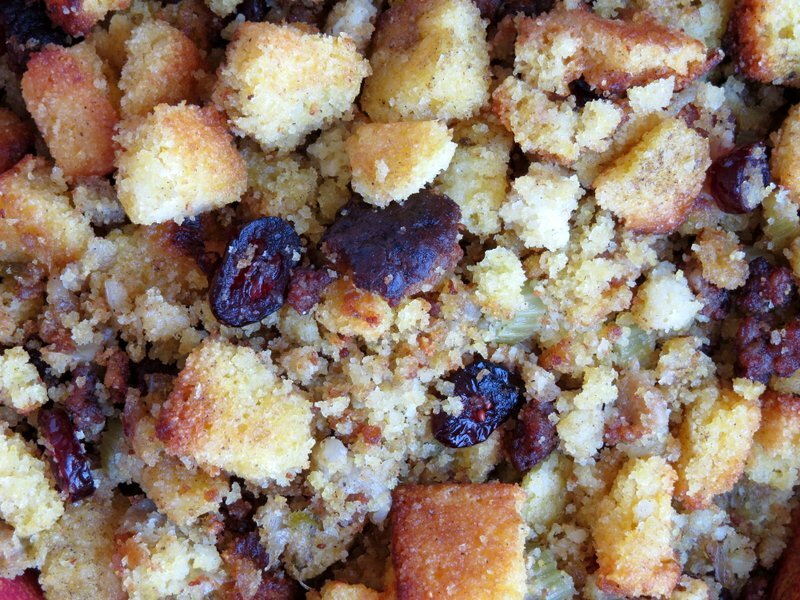 This cornbread dressing recipe includes savory sausage and sweet cranberries. Preheat oven to 400°. Spray baking sheet with cooking spray. Whisk together the cornmeal, flour, sugar, baking powder and salt in a medium bowl. In a small bowl, whisk together the milk, oil and egg. Add to the dry ingredients, and stir just until combined. 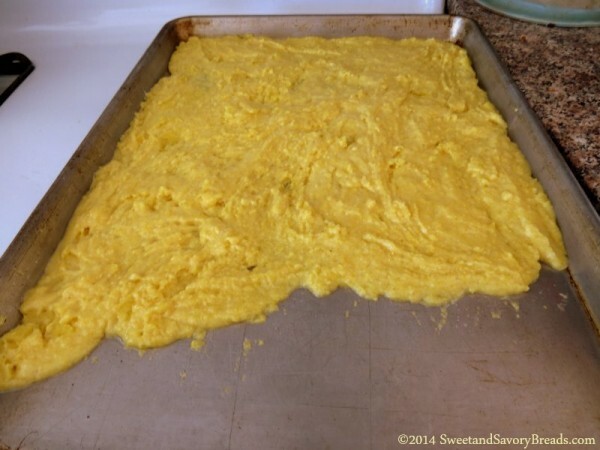 Spread batter evenly onto the baking sheet. It will be approximately 1/2" thick. You will have room in the pan that is not covered. Bake for 15 minutes. Turn oven down to 200°. Remove pan from oven, sprinkle with sage, and season with salt and pepper if desired. Cut into 1" cubes and spread them evenly on pan. Place back in oven for 30 minutes. Heat 1/4 cup butter in a large skillet. Add onions and celery until translucent. Remove from heat and add salt and pepper. 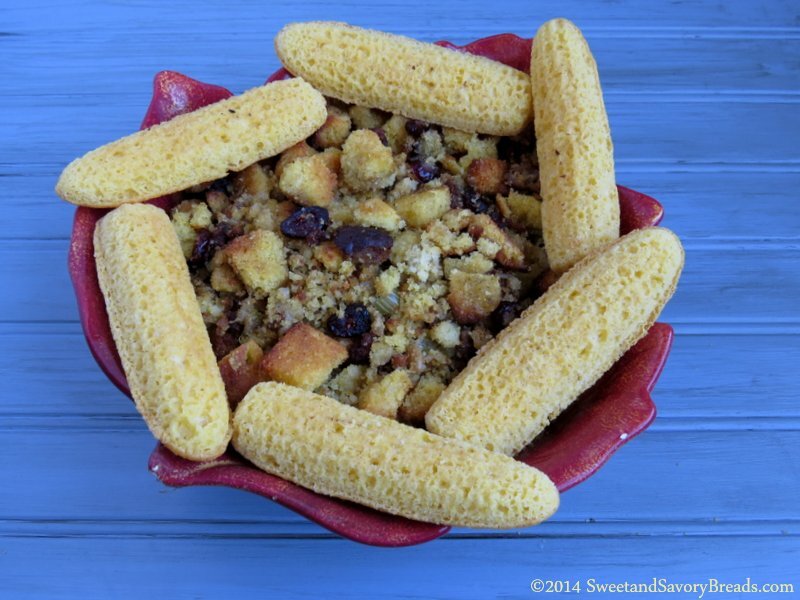 Separate the cornbread cubes from the crumbs and place them in a large bowl. Add the sausage and the onions and celery mixture. Combine gently while adding chicken broth. Add just enough to moisten all bread cubes. Place in an 11"x13" baking dish. Place slivers of butter on the top of the dressing and sprinkle any remaining cornbread crumbs on top. Bake for 30 to 35 minutes. This recipe can be made the day before and placed in the refrigerator. Reheat the day of in the oven with added chicken broth. I added an additional 14 oz can of broth, stirred, covered with foil, and placed in 300° oven for 30 minutes. Have you tried this recipe? Have you made something similar? Does a step seem unclear? Comment below, we'd love to hear from you! Posted in Fall Recipe Series, QuickbreadsTagged DressingBookmark the permalink.